�����Little has changed over the last couple of weeks as metals remain soft at best. Gold is hovering just under the $1,220 mark and Silver is around $17.50. Neither of these levels will instill confidence in this current market. One ounce Proof Gold Eagles have fallen to $1,425 in OGP; Proof Silver Eagles are wholesaling at $49 each. Even Proof $100 Platinum is down to $1,455. Ninety percent Silver Bags are trading at $12,875 and forty percent is at $4,965. Silver Dollars are $24,525 for thousand dollar bags in VG quality. �����Registry collectors may have slowed down their buying habits over the last couple of years but there continues to be aggressive competition for the best coins certified for the series and date. 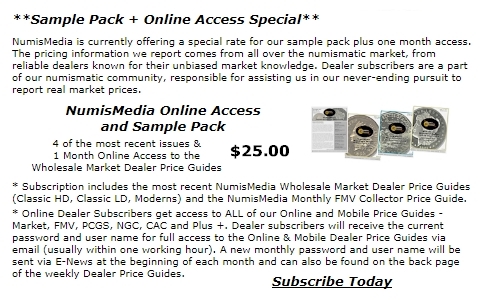 Many prices for Modern Lincoln Cents have increased in this week's Moderns Wholesale Market Dealer Price Guide. The 1936 S MS67 Red is higher at $950 Market and the 1947 MS67 Red has jumped to $2,275. There are only 42 total coins certified in this grade for the 1947, and at this Market price the coin will need to be very attractive. Coins that have any discoloration or have begun to tone will need to be discounted, sometimes severely. �����While the Washington Quarter series is still very popular, especially the highest grades prior to 1955, we are seeing lots of discounting for coins that are easily found in most dealer inventories. In addition, some of the higher grades that were advancing over the last few months appear to be more plentiful at this time, thus prices are being discounted slightly for various dates. Several dates from 1937 to 1950 in MS66 & MS67 have retreated this week including the 1937 S in MS66, now at $500 Market and the 1940 D in MS67 down to $875. Proof 67 and higher Washington Quarters seem to be enticing more buyers at higher levels. The 1937 through 1940 are higher this week in PR67 with the 1950 Cameo up to $975 Market. 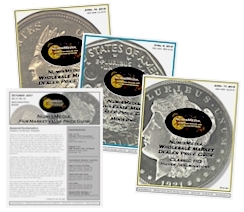 �����Despite the fact that the majority of the Gold, Silver, and Platinum modern coins have declined this week, there are a number Commemorative Silver Dollars that are higher in the PR70 grade. Below are a few of those coins that have seen an increase in Market prices. 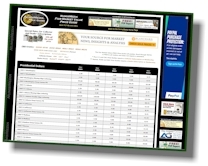 �����New dates have been added to the Online Price Guides to include the latest issues from the U.S. Mint. The updated series include Lincoln Cents, Jefferson Nickels, Roosevelt Dimes, Washington Quarters, Kennedy Halves, Presidential, and Sacagawea Dollars. The latest dates have also been added to the following charts: Eagles, Modern Halves, Modern Dollars, $5 Gold, $10 Gold, Buffalo Gold and the Silver 5-ounce America the Beautiful coins. More prices will be added to these categories when obtainable.